With a massive 2015 and 2016 of golfing achievements, Glen has shown a whole new side to golf that some of us could never imagine being possible. Always being an avid golfer and playing every weekend, when Glenn was involved in a car collision that left him blind at 22 years of age. Instead of giving up on his passion, Glenn turned to golf and discovered a coach by the name of Bill, who has been working with him since 2008. 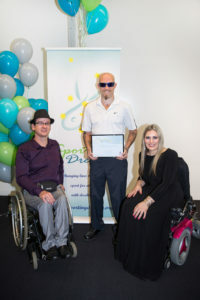 Glenn became involved with the Blind Golf Circuit in 2010 and after just one year, he was ranked in the top 10. Glenn has now gone on to place in various state and national opens. As quoted by Glenn himself, “even though I have lost my sight, I will never lose my vision”.